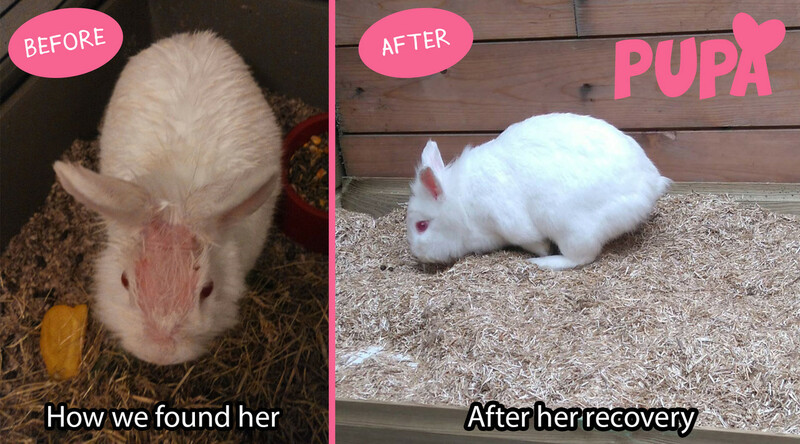 I have a small non-profit animal sanctuary in the Netherlands called Pupa's Sanctuary. I take in neglected, dumped and abused animals and give them a permanent place to grow old and happy here. At the moment I take in small animals (rabbits, rodents, birds, chicken etc), dogs, ferrets etc. and sustain all of them with my charity webshop Pupa, and my other job, and some donations every once in a while. In the future, I'd like to take in farm animals as well, but my current location doesn't allow that. I really enjoy doing this: giving these poor animals a second chance in life. Soon Pupa's sanctuary will be an official non-profit charity on paper. I'm just getting started, but I hope that it will grow enough for me to buy a farm, so I'll have the space to take in more animals who need help. By buying from this shop, you support the animals in Pupa's sanctuary. But instead, you can also make a direct donation, either a one-time donation, or a monthly donation, of which 100% goes directly to the care, feed and treatment of animals in need of help. Thank you for considering to support our non-profit animal sanctuary! How would you like to support?